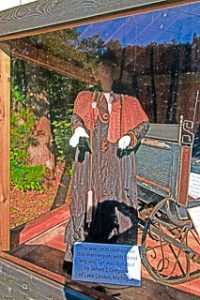 Donated to the Society in 1998 by the grandsons of blacksmith Amos Bammert, the shop was built in the 1880s at the Cliff Mine location and moved to Phoenix in about 1906. Amos, born in 1863, operated the shop until his death in 1940. 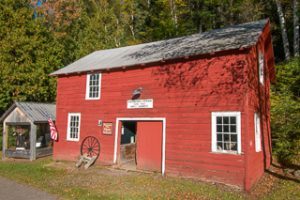 Blacksmiths were much in demand in the early days of Keweenaw copper mining, as horse-drawn carriages and wagons were the principal means of land transportation until the arrival of the Keweenaw railroad in 1907. In addition to shoeing horses, blacksmiths could repair and make almost anything made of metal. Amos built buggies, sleighs, and wagon wheels in this shop. Many of the tools of the blacksmith trade, including the forge, were left undisturbed in the building when the business was closed. The Society has restored the building's exterior and interior, exhibiting the shop and equipment as they were at the end of the nineteenth century. Click here to see a PDF copy of our Bammert Blacksmith Shop pamphlet. Be sure to use your browser's "BACK" button to return to this page after reading the brochure.